Got a little bit of a late start, I had to run out to Harbor Freight after work to pickup a die grinder for the work tonight, and ran a few other errands, but I managed to put 3.5 hours in, and have the rear spar ready for metal finishing and then priming. 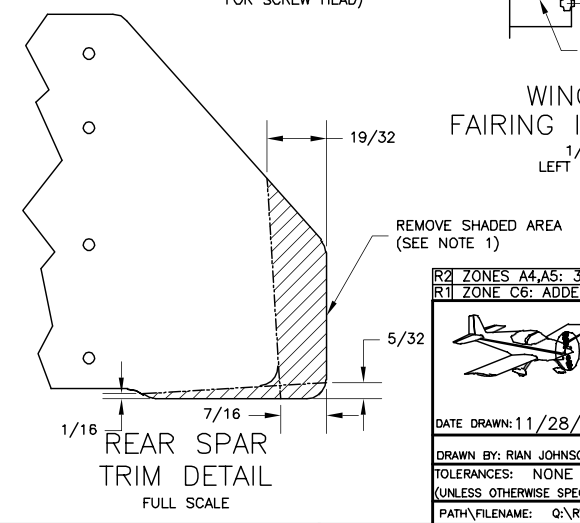 I am at the start of the “Assembling the Rear Spar” section of the plans, and the main spars are done for a few more steps. 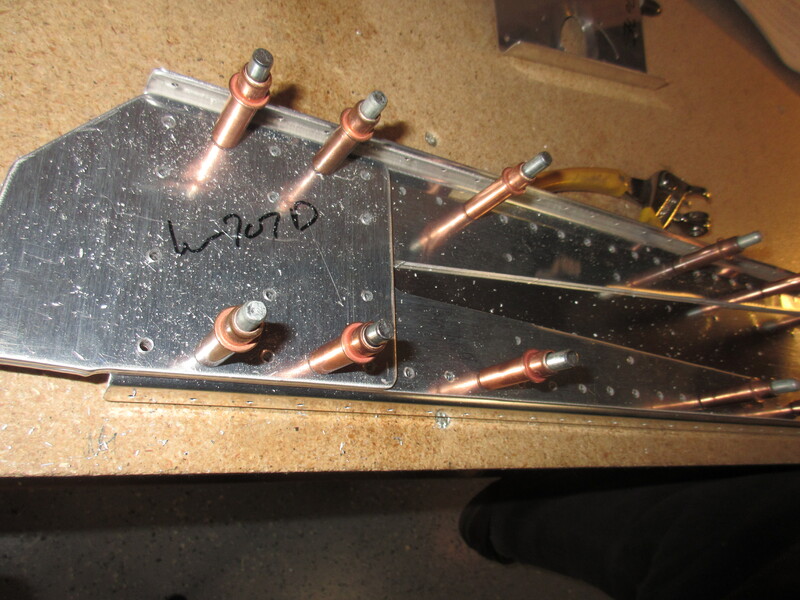 The session started out by deburring all the edges of the rear spar parts: W-707A rear spar channel, W-707E and W-707F doubler plates, W707G reinforcement fork and the W-707D rear spar doubler. I deburred the edges using the scotchbrite wheel, which made quick work of the parts, even the long rear spar channels. I first decided to cut the W-707D Rear Spar Doubler first, since it would be cheap and easy to ship in case I messed it up. Note how the shaded part is angled a bit and there are 4 measurements I had to make and then mark. 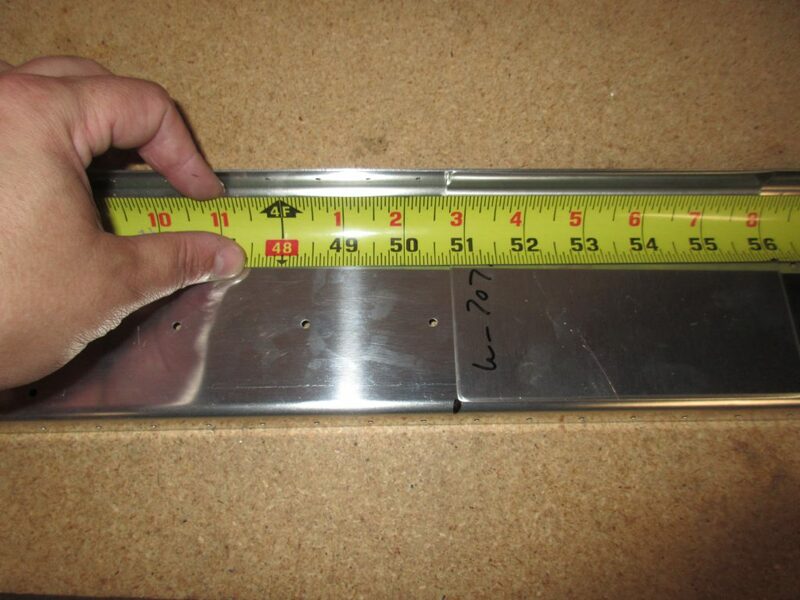 Once I had my marks made, I connected the marks with a straight line using a machinists ruler. After confirming everything was right, I decided to cut it using my bandsaw with a metal blade. 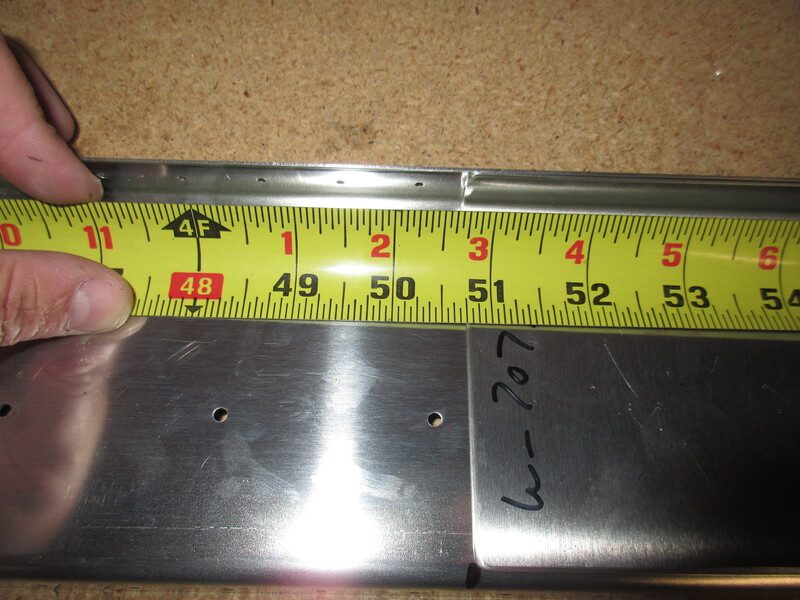 This is thick aluminum, so snips was not an option and I figured I would cut with the bandsaw and then grind away any odd cuts or un-eveness from the saw. It actually turned out really nice, and only needed a very small amount of grinding! Once I had this piece looking right, I used it as a template for the others. 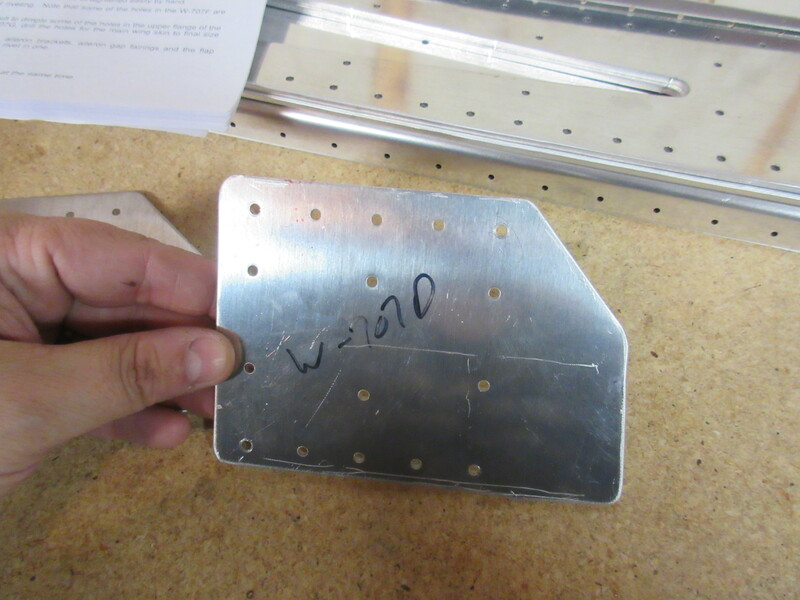 I have to make this same cut on the W-707D for both sides, as well as the W-707G reinforcement forks for both sides. I just cleco’d the freshly cut doubler against the other pieces, and marked the edge with a sharpie, and cut them on the bandsaw. After grinding the edges and deburring them to a smooth edge on the scotchbrite wheel, they were done. Now that I have all my rear spar parts deburred, trimmed and ready to go, its time to start assembling and drilling both rear spars. I clamped W-707E and W-707F doublers into their locations. W707F was pretty easy, since it mounts flush against the most outboard edge. The W-707E needed some measuring. 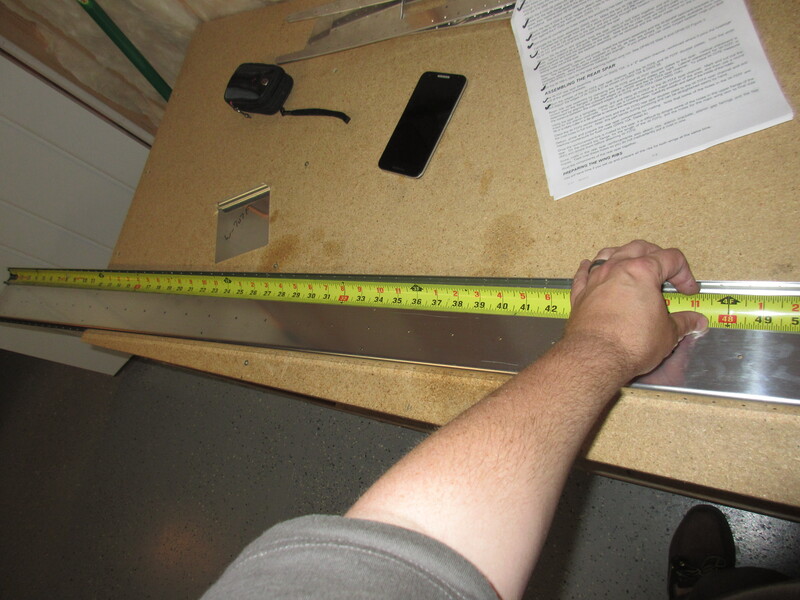 The plans calls out to place the most outboard edge of the doubler 50 and 3/4″ from the outboard edge of the rear spar channel. 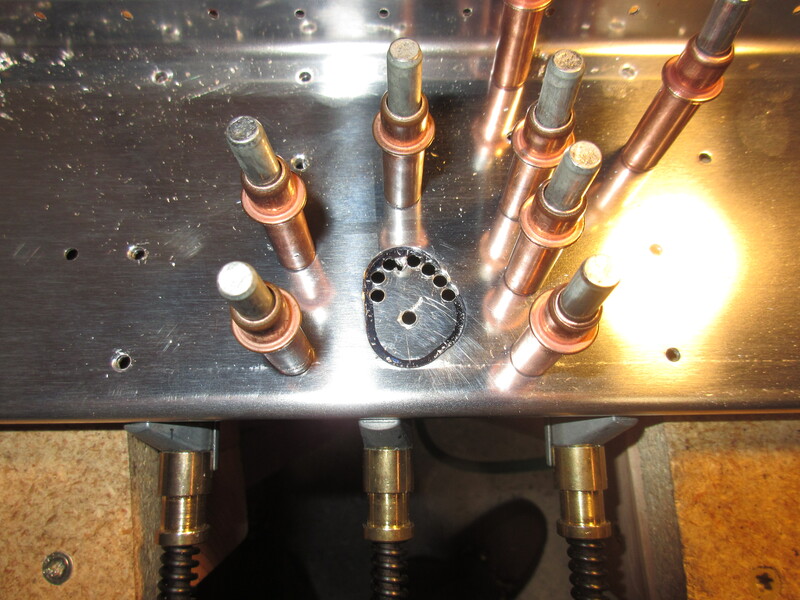 Once they were both in place, I clamped them down with side clamps and then match drilled all the holes to a #30 after double checking all the rivet sizes in the plans. This is the easy one! 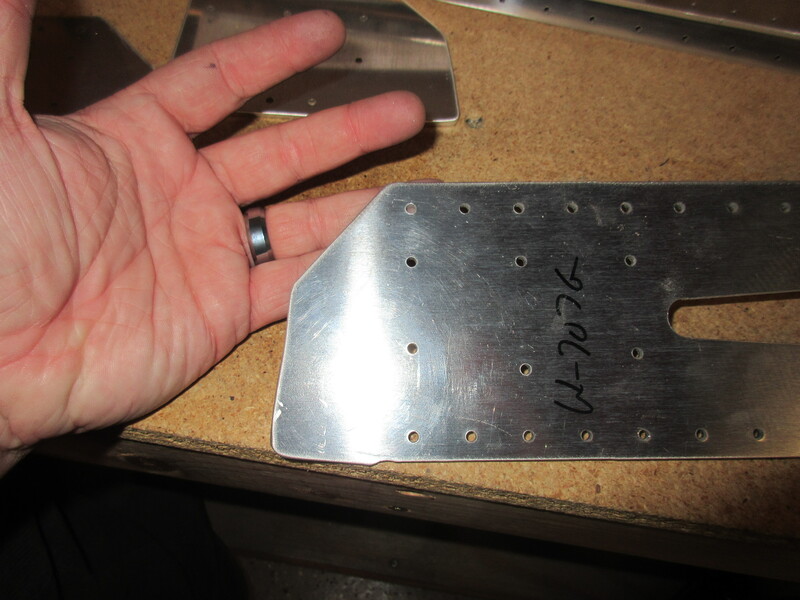 Once I had all the rivet holes drilled to size, the next step is to cut out the hole for the aileron pushrod in the doubler plate. 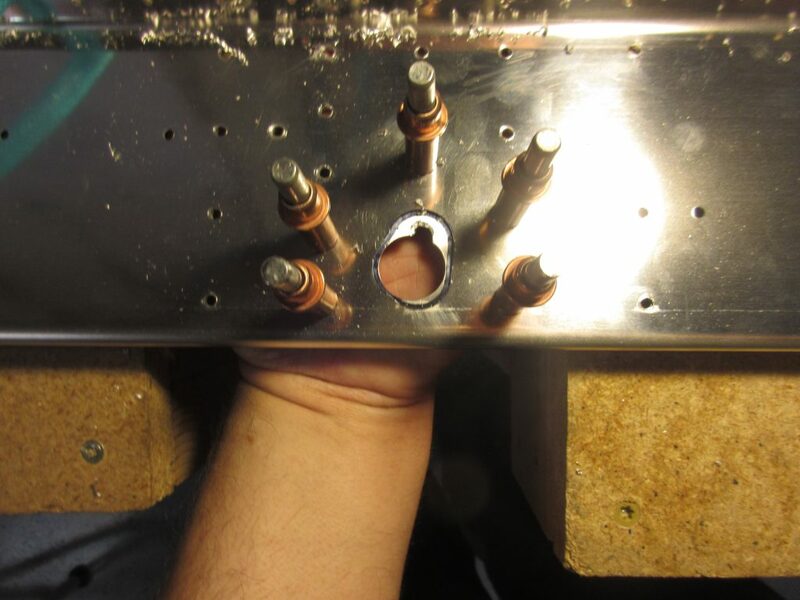 I flipped the rear spar over, and use the pre-punched hole in the spar to mark the location for to transfer the hole to the doubler plate. Then, I used a unibit to drill out the largest section of this hole, and used a #40 drill bit to drill out the smaller section. This is to get everything started so I can file, grind and trim it the rest of the way. Once I had the holes to about close as I could get (notice there is still some black sharpie lines to be trimmed out in the photo above), I removed the double and used a combination of files (round, and flat of different sizes) and then fired up the die grind with a small grinding wheel to grind down what remained of the metal. I then finsihed up the holes with a scothbrite pad to remove any burrs that may have been left behind. I am pretty happy with how they turned out. They are slightly larger than the hole in the rear spar, but I think that’s fine. 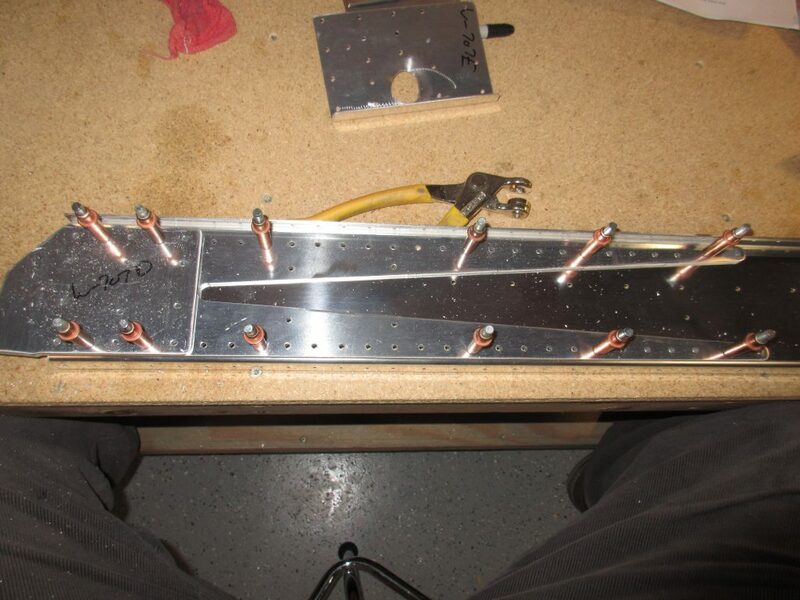 Next up was to just repeat these same steps on the right wings rear spar. I did the aileron hole a little different, but drilling even more #40 holes to make the grinding and filing go a little quicker which seemed to have help cut down on the time it took. I still used the unitbit in the larger middle-ish section which removed about 97% of the metal I needed. 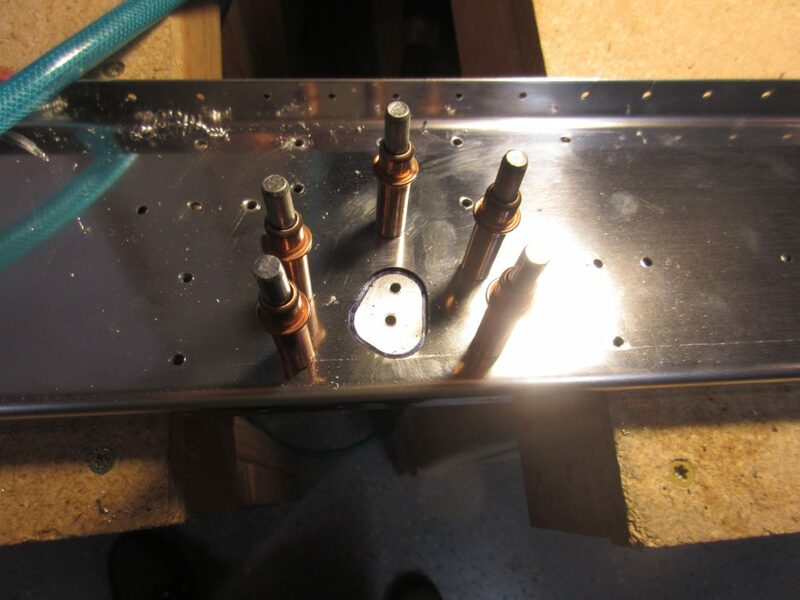 I still had a little steam left, and I wanted to get these rear spar parts completed to all that was left was hole deburring and then priming, so I pushed on to the match drilling of the W-707G reinforcement fork and W-707D doubler plate. 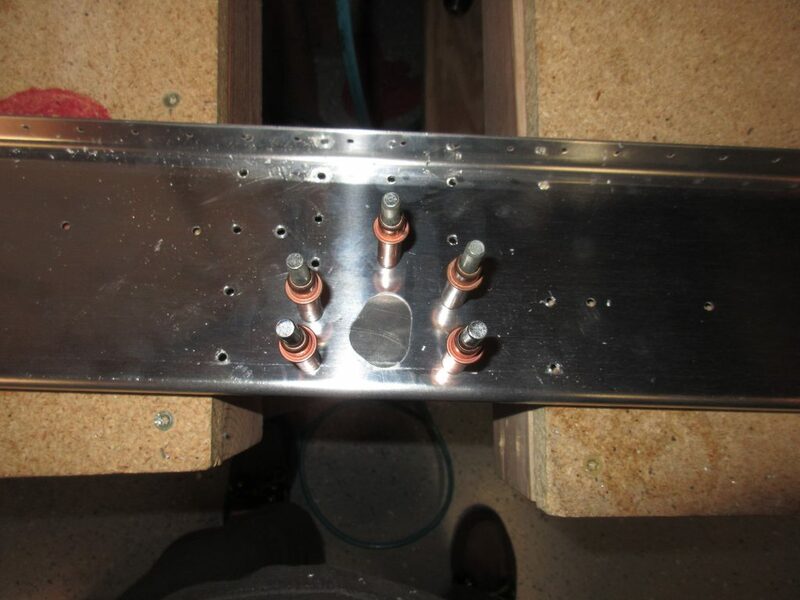 I studied over the plans to make sure that all the holes were using a #30 drill, and then clecoed the reinforcement fork and doubler plate to the rear spar channel. I did both rear spars at the same time since it was easier this way. 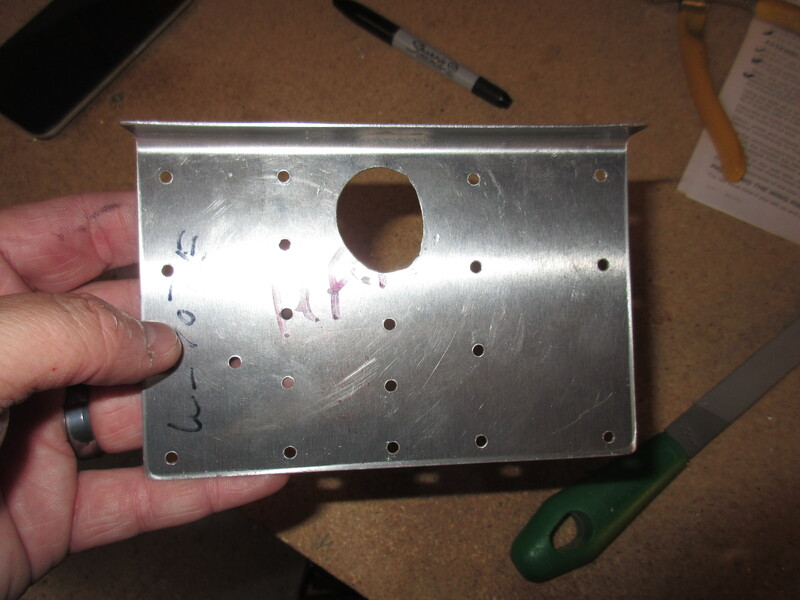 Then, lastly, match drilled all the holes to #30 on both rear spars, and marked the parts which was left and right. 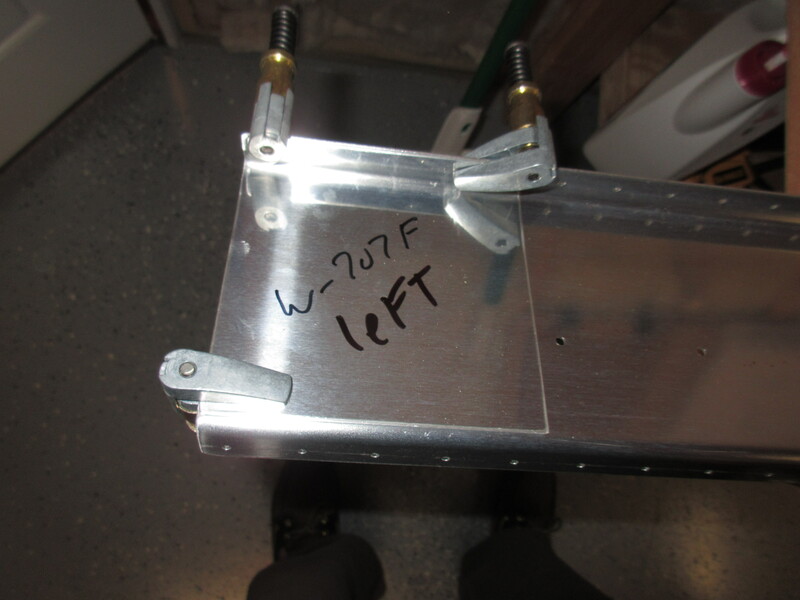 Tagged Rear Spar. Bookmark the permalink.